DB Sports are proud to sponsor the player of the tournament in next weeks Hibernia Trophy, taking place next weekend (August 18 – 20) at Pearse Park, Sallynoggin, Co. Dublin. 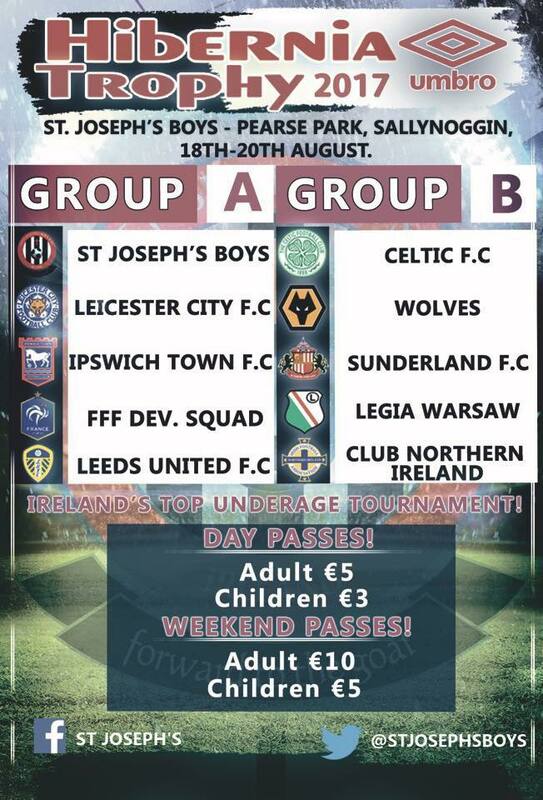 Held by the illustrious youth football club St. Joseph’s Boys, the Hibernia Trophy is Ireland’s top underage elite football tournament, bringing together stellar names in world football, ensuring the highest quality of football on show. Over the course of the three days the likes of Leicester City FC, Celtic FC, Wolverhampton Wanderers, Ipswich Town FC, Leeds United and Legia Warsaw will take part. Onlookers will want to keep a keen eye on proceedings; past players of the Hibernia Trophy now light up the Premier League and beyond. Irish legend Robbie Brady once starred in the Hibernia Cup, while Liverpool’s Ben Woodburn was a previous Hibernia Cup star, as was current Newcastle United midfielder Jonjo Shelvey. Admission for the event is priced at €10 for a weekend adult pass and €5 for a weekend children’s pass, whereas a day adult pass costs €5 and a day child pass costs just €3. The action begins on Friday evening at 5pm, with the final game beginning at 7.20pm. Saturday’s action starts at 10am, with the last game ending at 5.30pm. And finally, Sunday’s matches begin at 10am, with the final kicking off at 1pm. All those attending are asked to get there early to ensure a good view of the action. While you’re here, why not check out the rest of our regularly updated blog here.